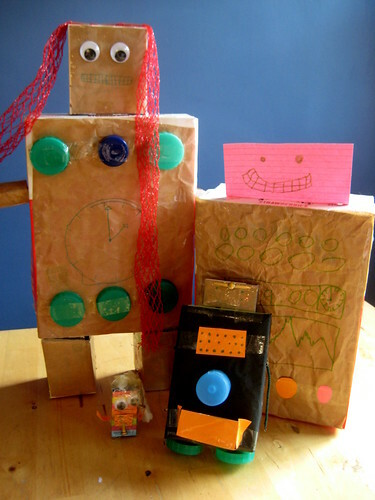 What a sweet family portrait of our junk model robots. Inspired by a book B is reading at school Saturday morning turned into robot making time. Step one: raid your making box / recycling bin / kitchen cupboards and see what cardboard boxes are available to create your robot. Step two: imagine all the things you’d like you robot to be able to do and add them in as special design features. Time travel, magic potion squirting, turbo boosters – no problem. Step three: assemble your robot. Regular readers will know my girls spurn glue in favour of sticky tape every time – no way do they want to hang around waiting for glue to dry when they’d rather be playing with their creations. As you can see here, Miss L loves her sticky tape! 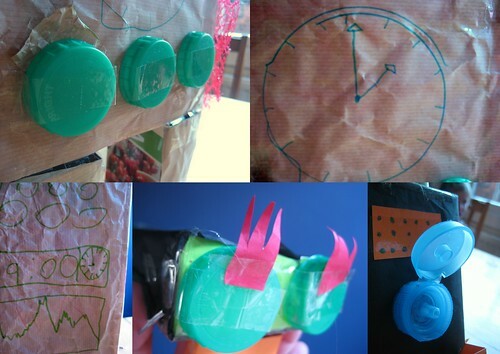 Glue or double-sided sticky tape would make for a neater robot, so you may prefer to use these. Split pins are great if you want your robot’s arms or head to turn. Then you’re ready to play. You can even turn yourself into a robot and spend the rest of the day walking round with stiff arms and talking in a monotone voice! 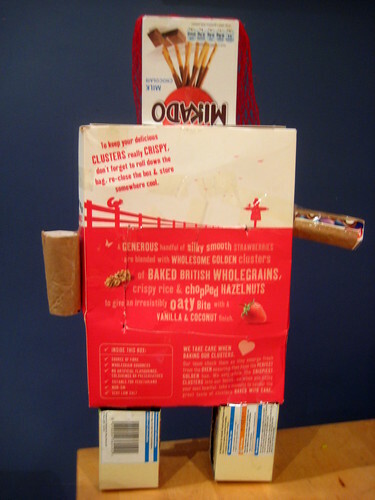 If you like our junk model robots then you might also like the ideas in our free ebook Glorious Junk! So inspiring, Cathy. I taught a similar lesson at an art museum I used to work at when we had a Robot exhibition. The children loved it, mostly because it’s so open-ended and up to their imaginations to determine the look of their robots. And of course, I love upcycling junk, too. Lovely. That’s made me smile Ali! 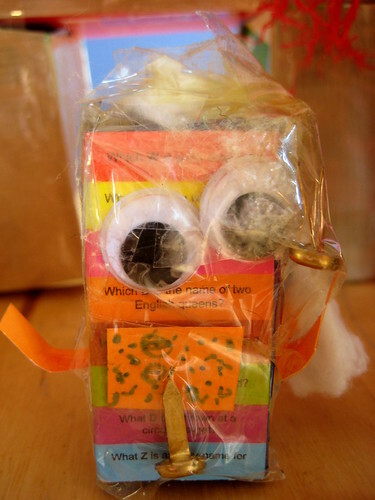 Nothing quite like a robot made from recycled materials! Love ’em! Thank you for linking to Kids Get Crafty! I hope you’ll let us see a picture Isil. My two bigger children would love those! Fab idea! I love all the different attributes of your robots! What a fun activity! this is great! may I ask what book it was inspired by?? Sorry grace, I can’t remember – this was quite a few years ago now.